The Innovation in Ship Operations category was sponsored by ASRY. The three short listed entries were judged by a very distinguished and knowledgeable panel of judges, chaired by Mr. Koji Sekimizu, Secretary-General of the International Maritime Organization. 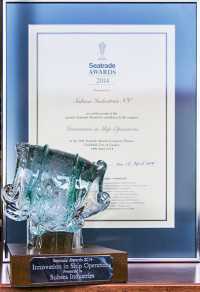 The award was presented by HRH The Princess Royal and accepted for Subsea Industries by David Phillips, Hydrex Group Communications Executive at the Seatrade 2014 Awards Dinner held at the Guildhall in London on April 14th, 2014. ECOSHIELD® durable, cavitation-damage-proof rudder protection. After more than 10 years of strenuous testing, Ecoshield was launched in 2013 for permanent protection against cavitation damage for rudders. The glassflake reinforced coating protects the rudder for the service life of the ship without need for recoating or major repair, and comes with a ten-year guarantee. Ecoshield is also suitable for bulbous bow, stabilizer fins, thruster nozzles and other underwater ship gear which needs special protection from corrosion. Now a very durable, tough, long-lasting glassflake resin coating is putting an end to these problems. Ecoshield is a specially reinforced version of the well-known Ecospeed non-toxic underwater ship hull coating. Small but significant variations of the Ecospeed formula have been tested on rudders since 2002 with extraordinary results. Ships that were experiencing heavy cavitation damage to their rudders, once the glassflake coating was applied, have seen no further cavitation damage erosion for as long as 10 years after application, with no sign that the coating will need replacement during the life of the ship. Subsea Industries is a subsidiary of Hydrex, an underwater technology company based in Belgium and the USA, which produces and delivers the Ecospeed® underwater hull coating system and Ecoshield, rudder and running gear protection.